ImpactX™ is a line of impact-rated insert bits and fastening accessories built specifically for the demands of the professional contractor. Professionals require commercial duty bits and fastening accessories that can endure the force of high-volume screw driving applications with high torque impact drivers. Standard screwdriving bits are brittle and fit poorly into fasteners, and in applications with high torque impact drivers this losing combo quickly leads to broken bits. 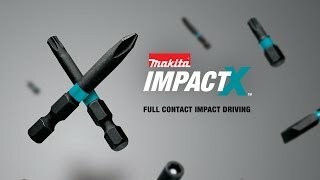 ImpactX™ hits back with improved fitment and increased performance with high torque impact drivers. Precision machined (not forged) tips ensure full contact fit, while performance-optimized and heat-treated S2 steel provides more flex and more durability than standard, brittle bits. Shipping Weight : .085 lbs.